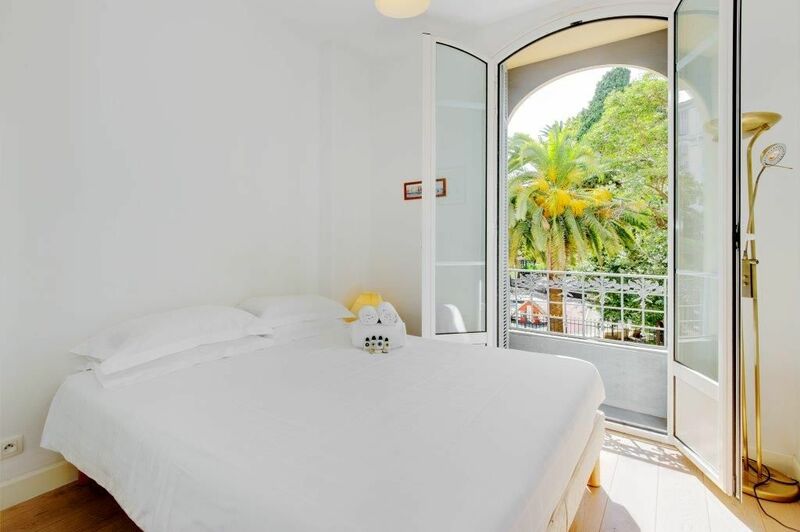 Centrally situated in a well sought out "Carré d'Or" location in Nice, only 400m to the famous Promenade des Anglais, seafront and beach, 200m to the pedestrian zone and 400m to the main shopping street, Rue Jean Médecin. Within easy access to the tram, buses and local train station. HugoPark103 is a contemporary one bedroom apartment with double glazing french windows, in an elegant "Belle Epoque" building. Situated on the first floor you can use either the lift or staircase. Enter into a fully fitted open plan kitchen and lounge/diner. The kitchen has everything you will need to make your stay comfortable and memorable, with oven, fridge/freezer, dishwasher, microwave and all cooking utensils. The dining table has seating for 4 and the sofa pulls out to a comfy double size sofa bed. The smart TV has English TV and sky basic satellite plus french orange TV. The bedroom has a king sized bed and sliding door mirror wardrobes. The shower room has a great shower, heated towel rail and hairdryer. Online booking available, credit cards accepted. To ensure you are not missing out do start booking in your dates early online now! Clean, well equipped and well presented property. Good views and a light airy feel. Everything was exactly what we expected and led to believe in the marketing material. Location was excellent for Nice. The apartment was comfortable and very quiet. There were two of us staying. There was a periodic drain type smell in the apartment from the washing machine space which needs looking at . The TV is far too complicated with conflicting instructions all of which led us to just giving up. This flat is perfectly located. It is a few blocks from the touristy part of town and a few blocks from the local part of town. It's a short walk to old Nice or the train station. You are literally two blocks away from a hub for the buses, two grocery stores, a wine shop, and a patisserie. Excellent speedy communication from the owner. So many good things to say about owner!! She's great. The flat has everything you need for a great holiday. It's an excellent size for two and perhaps a child. What I thought was so sweet was the pantry. There is a wee tiny supply of things one might need on vacation. Seasonings, vinegar, that sort of thing. I left something for the next people as well. The bathroom is a great size and the shower has good pressure. Plenty of storage for clothes in the bedroom and supplies in the bathroom. The clothes washer and dishwasher made everything easier. These are European appliances and European sizes - think smaller loads. There is a deluxe dry rack in the unit for hanging wet clothes. Even after the funk, we would stay there again. It's a great space in a perfect location. This apartment is perfectly placed for enjoying the best that Nice has to offer. It is well equipped for self catering and is a comfortable and quiet place to rest after enjoying the sights and sounds of Nice. Annie is a responsive and helpful host who made us very welcome. Wonderful Apartment and Excellent Location!!! The apartment was amazing especially for its location being in a perfect spot; close to everything, but far enough for quiet and relaxation. We found that the apartment is very comfortable in hot weather, as there is effective air conditioning system. Everything is close enough - beach, old town and Monoprix supermarket in 5 minutes walking. Annie was very friendly and helped us a lot to prepare our visit. We would highly recommend this place to anyone wanting to experience NICE and it's surroundings. WIFI was solid. First, Annie was wonderful to work with, any issues or questions were addressed immediately! also the apartment building has a lift, which helps when you have bags/ groceries etc... The apartment was close to everything and very convenient. very sunny in the afternoon which i really liked. The bed was comfortable,it is a bit firm so if your a fan of that you'll be happy!! I did have some issues with the TV and was only able to get the news channels but i had my laptop and the internet worked REALLY well! there is a washer but i dried all my items on the provided "european rack" There is a nice roller cart for grocery shopping and a few beach umbrellas there. I would stay again. Dear Robin, I am glad that you found all things were central and easily accessible to make your vacation in Nice a most enjoyable one. Points you kindly noted and made me aware were acknowledged and passed on to my property manager to attend to. You were a delightful guest to have and I hope to welcome you back in your next trip to Nice! 400m off the famous Promenade des anglais. Turn left after the Meridian hotel onto rue Halery, bear left onto rue Macarani, cross 2 traffic lights and you will find the apartment on the right. There are so many just to name a few: Famous museums, restaurants galore, Cours Saleye farmers and flower market, famous Promenade des anglais, aqua blue sea, private beaches with sunbed and restaurants. Take a picturesque train or bus trip to Monaco, Eze Village or Cannes, or drive to the beautiful villages or up to the mountains to ski.